"Galaxy Note 4 will continue to set standard how smartphone should help our life become more ambitious, more enjoyable and more efficient," Samsung Electronics President of IT and Mobile Communications Division DJ Lee said while unveiling the Note 4 here. The Galaxy Note 4 has 5.7 inch display similar as in Note 3 launched in October last year. The screen display has moved to advanced version Quad HD from Full High Defintion. This will give better viewing experience in terms of contrast, density of colours etc. In the new Note 4, Samsung has incorporated multi-function feature on same screen which will allow users to use function like chatting on same screen along with reading as it happens on computer. The Note 4 has 16 megapixel rear-facing camera and a 3.7 megapixel front-facing camera that up to 120 degree wide angle shot. Samsung representatives said that Note 4 has lower power consumption increased battery life by 7.5 per cent compared to previous model. The battery capacity in Note 4 is 3220 mAH compared to 3200 mAh in Note 3. Samsung has introduced snap feature in S Pen which come with Note 4 for writing on phone. Snap feature allows to select a portion of image or text on screen and share it with desired person through email by simply pasting the selected image or text on email or another application that allows sharing of image or text. The company unveiled new edition in Note series-- Galaxy Note Edge, which has a separate screen on the edge of phone equivalent to breadth of a pencil and runs parallel along with screen. This screen can display SMS or email text, alarm, time, etc as customised by user. The Galaxy Note 4 will be available in Charcoal Black, Frost White, Bronze Gold, and Blossom Pink in global markets starting in October and the Galaxy Note Edge will be available in Charcoal Black and Frost White in select markets through Samsung? 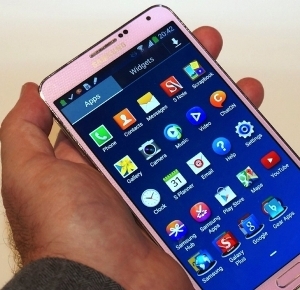 s retail channels, e-commerce and carriers later this year, Samsung representatives said. The company did not unveil price of any of the product. A Samsung representative said that the price will be decided at the time of shipping of devices and as per the market where devices will be sold. Samsung announced partnership with Swarovski for mobile back covers and band for smartwatch. It also unveiled two models of stylus in partnership with premium pen maker Mont Blanc. Samsung, which is the world's largest smartphone maker, is betting big on these launches as it faces tough competition from the US-based Apple. The Cupertino-based firm is expected to launch a larger screen variant of its popular iPhone, along with a new smartwatch. Samsung is also witnessing competition from local players in developing markets such as India and China. According to research firm IDC, 301.3 million smartphones were sold globally in April-June 2014, up 25.3 percent from 240.5 million units shipped in the same period last year. Samsung accounted for over 25 percent share, while Apple had over 11 percent share.